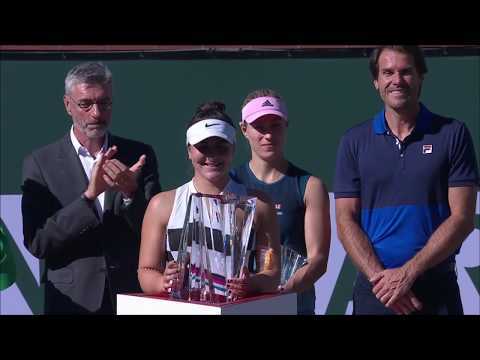 Bianca Vanessa Andreescu has become the fourth straight Canadian girl to be crowned champion at the prestigious U16 Orange Bowl in Plantation, Florida thanks to a 7-5, 6-3 victory over No. 11 seed Dominique Schaefer of Peru in the championship match on Saturday. The 14-year-old, seeded No. 8, lost just one set through six matches en route to the title. Currently sitting at the No. 333 spot on the ITF junior world rankings, Andreescu is currently part of Tennis Canada’s national junior training program in Toronto, where she is being transitioned into the full-time National Training Centre in Montreal. Andreescu’s triumph means the girls’ U16 Orange Bowl singles trophy has not left the hands of a Canadian since 2011. The three previous winners of the event are Charlotte Robillard-Millette (2013), Gloria Liang (2012), and Erin Routliffe (2011). Another Canadian has walked away a champion at the Orange Bowl this year, with Christian Lakoseljac taking the U16 boys’ doubles title with Indian partner Basil Khuma. The unseeded duo ousted the No. 5, No. 2, and No. 8-seeded pairs on their way to the title. The Orange Bowl is one of the most prestigious junior tennis tournaments in the world, with past champions including players like Caroline Wozniacki, Marion Bartoli, Andy Roddick, and Roger Federer. Canada has never won a boys’ title at the tournament but Gabriela Dabrowski (2009) and Carling Bassett (1982) are past U18 champions, in addition U16 winners Routliffe, Liang, Robillard-Millette, and Andreescu. Next up on the junior calendar will be the Junior Orange Bowl for the U12 and U14 age groups, taking place next week.